Lately, I have been struggling with easy, no-alcohol-or-food-involved date ideas. Which also means that I do not want all my dates to be at night or involve make-up and dress-up situations. When I heard of the ofo bike sharing program, I knew I had found what I was looking for. 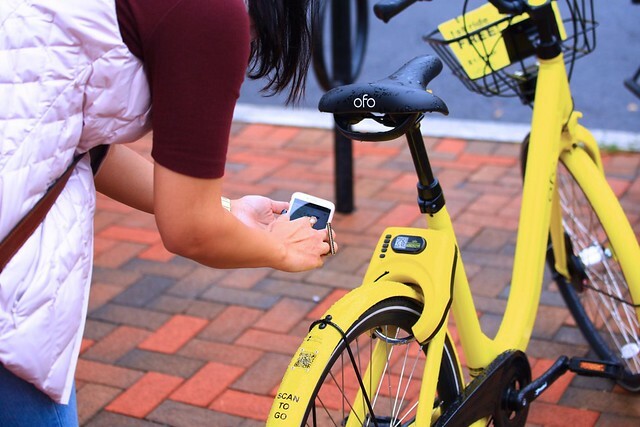 ofo was launched in June at Peking University as a station-free bike share scheme. 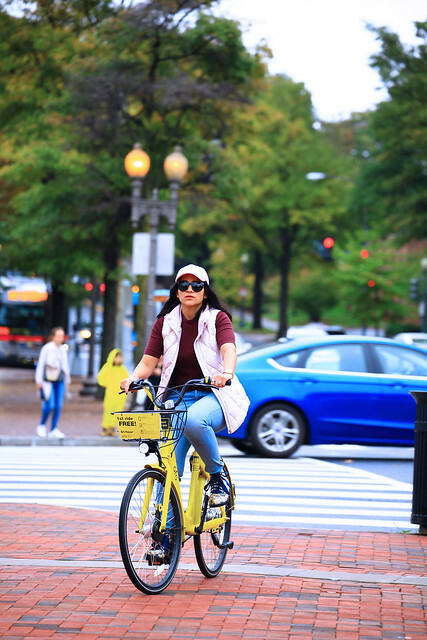 Their bright yellow bikes (which are hard to miss) are available to ride all around the DC area for $1.00 per hour and the first hour is free! Just download the app, unlock the bike and go! 1. Open the app and find all the bikes in your vicinity. All available bikes are marked by a yellow marker. 2. When you are at the bike, tap the “unlock” button and scan the barcode (or enter the number manually) to automatically unlock the bike. 3. Explore your city and arrive at your destination safely. 4. At your destination, simply park your bike safely and legally, and manually lock it to automatically end the trip. We found the whole process simple and easy. It was such a fun date-day. We didn't have to lug the bikes around, we didn't have to figure out a way to rent a bike in the city. All we needed was our phone and internet. Also, as someone who uses the Metro to get from Maryland to D.C. I look forward to using the bike for my everyday appointments and saving money on cabs and getting a little exercise in at the same time. ofo is built around the spirit of sharing. 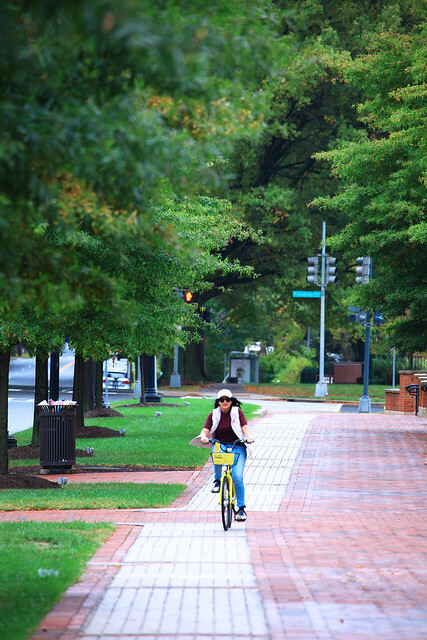 Explore D.C. with the station-free shared bikes. 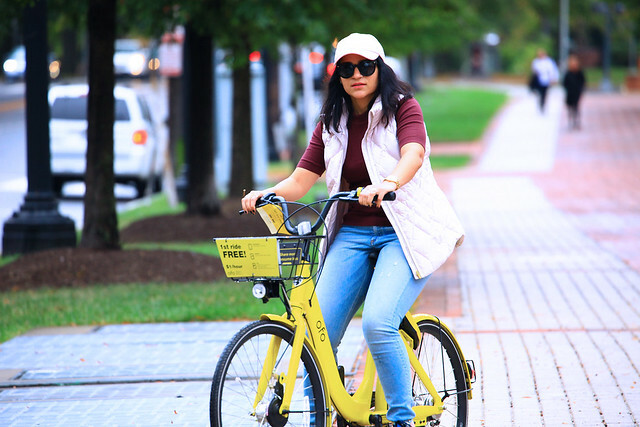 Not only is it convenient and easy but you would also be making a positive environmental impact by reducing carbon emissions and congestion in the city through the bike sharing revolution. This is a sponsored conversation written by me on behalf of ofo. Thia is like a great idea for a date. I have always loved bicycle rides and that color is just giving me life. i will so love to try this and you look stunning on it. Oh wow this is an awesome idea! What a great way to catch sights with a date, get some exercise and have a laugh together. Also the $1 makes it really good but fantastic for the environment too!! I see these or something similar on the University of Cincinnati campus. Its such a great idea! Our city recently got these bikes and my husband and I are so excited to try them out! What a genius solution to a practical problem! But also, as you mention, a great date activity. Need this to come to Louisville! Okay, your blog and your photos are amazing. Well done! Ok Confession time... I don't know how to ride a bike. I fell off a bunch scraped up my legs and I was done with that mess. Lol but yeah I need to learn. This is a great idea! Especially for a date in DC! Parking is an absolute nightmare there for any event (like the cherry blossom festival) or the museums and the zoo. So not only can you enjoy each other’s company on a scenic bike ride, you could easily get to a nice destination with no fuss. Love it. Awesome date idea. Love the photography as well. That is such a good deal! Only $1 an hour?! I wish we had that here! I think this is an amazing idea! I would have a fun time doing this and to be able to get a workout while doing so? Score! I like the bike sharing program idea. Seems like a great way to enjoy each other’s Company while getting some action in. Not a lazy date. Neat looking bike! That's a novel idea for a date! This concept is so popular these days and out here we have obikes on the same league. 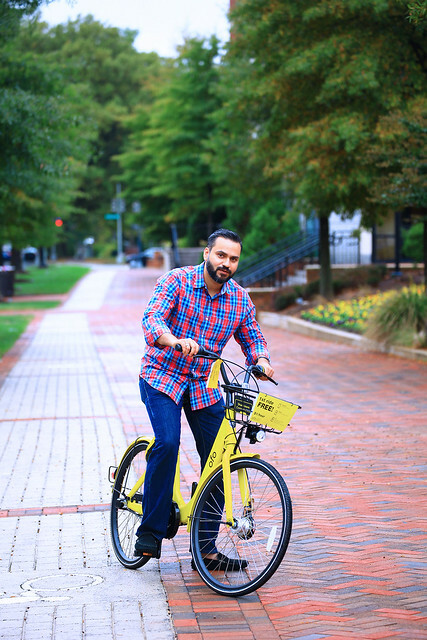 ofo bike sharing looks perfect for a date. Plus it has health benefits and zero pollution.this type of idea should launch in india as well ..we need it badly.thnks for sharing it. Great photos and such a great date idea! I love your outfit, I'd totally wear that! A bike ride sounds like a fun activity for a date! Beautiful photos!! Ben and I would love to do this!! We have something similar to ofo in Austin!! It’s so convenient when traveling downtown and around the city. This is such an awesome idea for a fun date with our love ones. I really love your pictures. 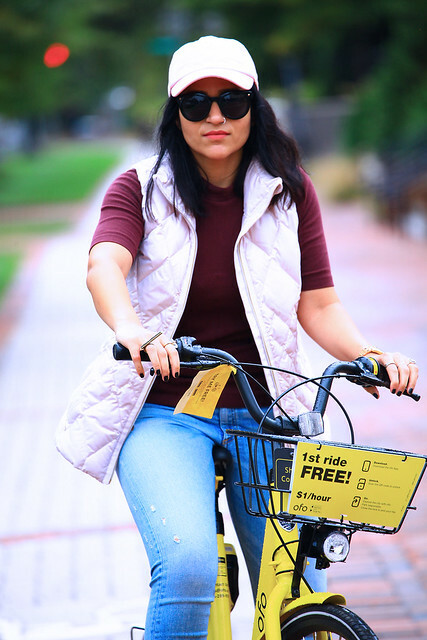 It seems that you really enjoy your fun date with ofo bike. Oh such a sweet and fun date idea. It's really fun to ride on a bike with someone we love, So sweet and fun while lovers are enjoying the beautiful surroundings. Fun outfit, and a date that involves biking looks totally awesome! Looks like fun was had by all! What a great idea! I wish my city had something like this! Believe it or not, I actually dont know how to ride a bike. This still looks like a fun date idea! Bike riding is a great idea for a day date! It’s good to change it up from a typical dinner.